Houseboats and Halloween, what does it mean for you? Is your boat ready for storage, or hanging decorations for halloween? For some houseboaters, it's a very colorful Halloween time of year, and for others, it's a sad time of year because it's time to prepare the house boat for storage. It all depends on what part of the hemisphere you're in? With the end of October upon us, we have two sections that will interest you, one is the popular Houseboat Storage Tips, and the other Houseboat Party Ideas. The Houseboat Forums are a great success. Looking for Halloween Party Ideas? If you're thinking of throwing a Halloween bash on the houseboat, here's the Top-10 Houseboat Party Ideas to make it an unforgettable evening. There's now a new Houseboat Show in town, and it's called the International Houseboat Fest, and it's gearing up to be major player. As to the other popular houseboat show, it's the National Houseboat Expo, and it's held in Louisville KY. As usual, I'm always looking forward to going to the houseboat show, so I guess this year, I'll have to go to both. Will I be seeing you there? Have you already been to a houseboat show? Tell us about it here, as there maybe many readers whom are contemplating going, and I'm sure that they would love to read about positive feedback on the show before planning the trip. International Houseboat Fest, in Louisville KY, on Jan 29-31, 2009. 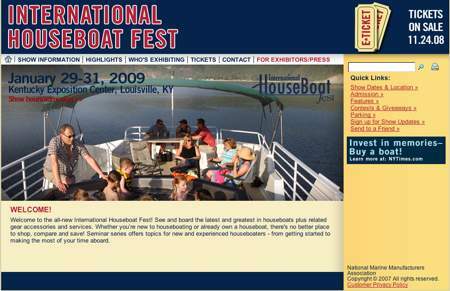 National Houseboat Expo, also in Louisville KY, on Feb 20-22, 2009. The Houseboat Forums are a Great Success! The new forums have been a great success, and thank you to all that have contributed or posted. It's amazing some of the excellent questions and comments that we receive from our readers and visitors. It's nice to see the forums are truly a "Help, and be Helped" central. How to Lift and Block Houseboats for Storage? Rules and Regulations for pontoon houseboats. Lake Powell Houseboat Rentals - Any cancellations, cheap, last minute deals? Convert or add an RV travel trailer to simple cheap pontoon house boats? Find a water leak on a houseboat?